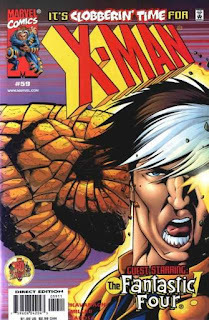 Summary: X-Man spars against the Fantastic Four, and later submits to Mr. Fantastic’s scan, which will enable him to trace energy from the Age of Apocalypse. Later, while bonding with Franklin Richards, a premonition leads X-Man to cut his visit short. As he leaves the FF’s headquarters, he’s ambushed by Caliban, who now serves Apocalypse as Pestilence. Caliban grabs X-Man and teleports away. I Love the '90s: The Human Torch is singing Ricky Martin’s “La Vida Loca” while sharing a shower with X-Man. If you’re looking for subtext, just remember this was written back in 1999.
Review: I half-suspect Terry Kavanagh wrote this as a try-out for Fantastic Four. The book was open following Claremont’s return to the X-Men, and Kavanagh had to know that he wouldn’t be on X-Man after the Counter-X relaunch, so it’s not a completely ridiculous theory. Can you imagine what a fifty-issue run of a Terry Kavanagh Fantastic Four would be like? Seeing the bond between the team makes X-Man long for companionship, but he’s determined to begin yet another new direction in his life. Now, he’s decided to track down all of the other escapees from the Age of Apocalypse in order to prevent them from somehow spoiling this virgin Earth (it seems to me that he should specifically target Apocalypse if that’s his goal, but whatever). As X-Man explains to Mr. Fantastic: “Took some trouble in Seattle to remind me o’ that, though. Again. Found an old friend and a new enemy, all in the same place…without even looking, guess that’s when I finally realized it’s time – it’s really time now – to start running after things, instead of away.” So Kavanagh has X-Man acknowledge twice in one little speech that his life has been aimless – oh, for about fifty-nine issues now – and it’s time to do something about it. 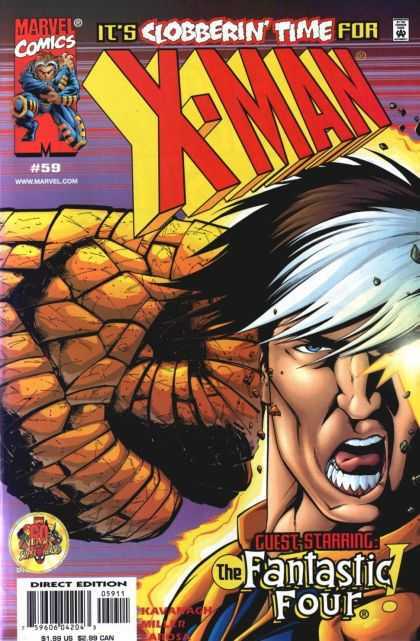 Kavanagh starts off this brave new direction by wasting the first half of this issue on a training sequence with the FF that’s unconvincingly played as a real fight, followed by numerous pages of X-Man chatting with the team, and then he gets attacked by Caliban on the final page and teleported away to participate in a crossover. Yes, I’m convinced all of this title’s problems are solved now. Summary: Selene takes Sunspot to the Damocles Foundation headquarters, where the Reignfire symbiote is being injected into a Gatherer in order to reawaken it. Selene and Sunspot are abducted by Sword and detained. Meanwhile, X-Force visits Sledge, following the revelation of Cannonball’s forgotten adventure. Ulysses Dragonblood and Arcadia Deville are with him. With the help of Veeg, they teleport X-Force to the Damocles Foundation, hoping to stop the reawaking of the Gatherer. The heroes reunite with Sunspot, but Selene betrays everyone by using magic to reanimate the Gatherer. Moonstar and Arcadia combine their reality warping powers and destroy the Gatherer and Reignfire. Furious, Selene swears revenge. Following the events of Fantastic Four Annual ’99, Selene now leads the Hellfire Club. Ulysses reveals the origin of his brother, Odysseus Indigo. Indigo is a Deviant who left the tribe and formed his own splinter group of Eternals, Deviants, and humans, all determined to “create and control the next species that will rule the planet.” Ulysses was a member until he realized his brother’s interests were “entirely selfish.” He left with Arcadia. Sledge tells Cannonball that he’s a Deviant who also abandoned his people. He claims that he views himself as an American, and was offered citizenship after he aided the State Department in the 1950s. The Gatherer de-evolves Sword into primitive lizard creatures while under Selene’s control. Arcadia and Moonstar now sense a strange connection following their encounter in X-Force #83. Arcadia says she’s now having dreams about the Demon Bear. Review: Plot, plot, plot, plot. It’s not necessarily a bad plot, mind you, and this is one of Anthony Williams’ better fill-in issues, so it does look nice enough, but this is yet another issue that’s more about the Damocles Foundation than X-Force. The character hooks are fairly weak (Cannonball now remembers meeting Sledge, and Arcadia and Moonstar now have a vague connection), so too often this comes across as generic heroes fighting a generic menace. The one interesting play on past continuity, Selene’s offer to Sunspot to claim his place in the Hellfire Club (presumably a reference to his deceased father’s membership), is quickly ignored so that the multi-faceted uber-plot must be fed. In a way, it’s impressive that Moore’s brought together almost every aspect of his several years on the title into one giant storyline, but unfortunately, it’s a massive story about a rogue Deviant and his numerous plot devices that doesn’t relate to the characters in an engaging way. Summary: Zsasz takes hostages at the Bates Home for Girls, threatening to kill a hostage every time the police intervene. After Zsasz kills two policemen sent to stop him, he’s confronted by Officer Montoya. A fatigued Batman breaks in just as Zsasz takes Montoya captive. Batman defeats Zsasz as the hostages escape. Meanwhile, Robin continues to track Falcon, and Mayor Krol pressures Commissioner Gordon to resign. Irrelevant Continuity: Robin describes Falcon as one of “the three jamokes that blasted the Riddler.” Again, this refers to a story not reprinted in the Knightfall trade paperback. Dramatic Exits: Officer Montoya pulls a Batman on Harvey Bullock by slipping past him while he’s discussing Zsasz’s standoff. Approved By The Comics Code Authority: A lot of blood in this one, including the slit throat of a police officer. Even the title of this issue is written in blood. Total N00B: What’s the deal with Zsasz’s eyes? Is he supposed to be wearing ‘80s New Wave sunglasses? Is this supposed to be some Sienkiewicz-style expressionism meant to symbolize insanity? Review: Okay, this is closer to what I assumed “Knightfall” would be. And, unfortunately, it represents a lot of the post-Miller Batman material that I don’t personally enjoy. A “realistic” serial killer that Batman somehow isn’t able to punch out in two panels, bloody murders everywhere, and ridiculous psychobabble trying to sell the idea that Batman’s no different than the villains he faces. This was almost novel once, but I think the expiration date on this material was out even before 1993. There has to be some line between making the stories serious enough to suit the event and just inserting Batman into Silence of the Lambs. So far, the storyline has veered between two extremes and neither is quite right. Also, I guess now is as a good as time as any to point out how much I dislike most of Kelley Jones’ covers. 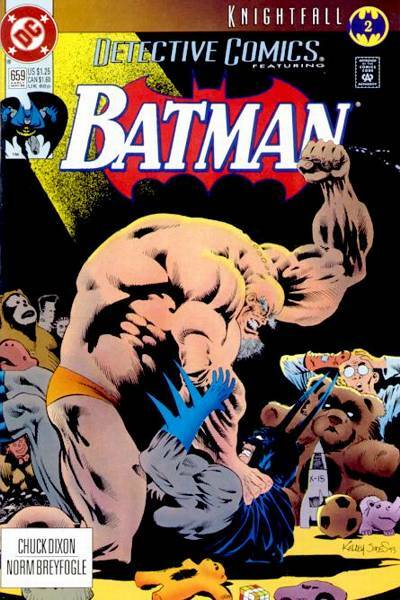 Apparently, DC felt that he was bigger draw than Aparo, Nolan, and Breyfogle, which seems crazy now. These comics were published in 1993, though, so it’s possible they were right. Summary: The Ventriloquist teams with fellow Arkham escapee Amygdala to search for Scarface. Batman and Robin follow their trail to a toy store. When Robin is ordered to stand back, he decides to follow the falcon that has been tracking the Batmobile. He soon locates Bird and engages him in a fight. Bane radios in and orders Bird to let Robin go. Meanwhile, a disoriented Batman defeats Amygdala but leaves Ventriloquist behind. The Batmobile’s police scanner reports Zsasz has broken into a girls’ school. Irrelevant Continuity: Robin makes another reference to his encounter with Bane, which apparently occurred in the same story as Bane’s fight with Killer Croc and his dismissal of Azrael. Robin also comments that Batman has “been sick” recently, referencing stories that are also not reprinted. I Love the ‘90s: “No justice, no peace” is written in graffiti in the Gotham back alleys. Review: This is another chapter of the crossover that doesn’t seem to have an appropriate tone given the circumstances of the story. The Ventriloquist’s quest to locate Scarface is not surprisingly played for laughs (Ventriloquist even creates a new puppet friend, “Socko,” this issue), and the mentally deranged Amygdala is mostly treated as a joke as well, although he stands up to Batman pretty well. 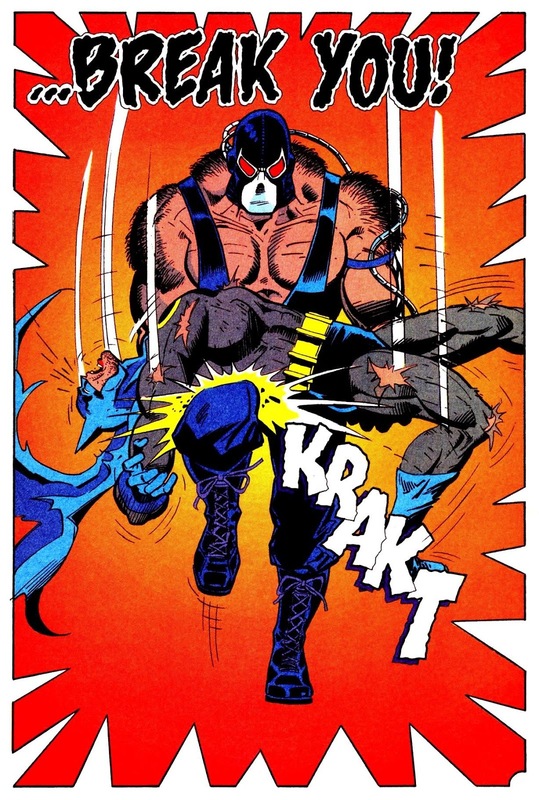 I’m also surprised to see Bird get a clear victory over Robin, but then again, I guess it’s not that big a surprise that one of Bane’s henchmen would get a strong heel push. And yet, I have a hard time picturing a mulleted bird aficionado getting the best of Robin, who’s supposed to be one of the better hand-to-hand combatants in the DC Universe to the best of my knowledge. At any rate, it’s another issue of Batman and Robin chasing Arkham escapees that’s so not grim I’m torn between admiring its willingness to have fun and just wondering what the tone of this storyline is supposed to be. Summary: The Mad Hatter robs a hat store and arranges for a meeting of Gotham’s underworld. He pressures them into wearing the hats, which are rigged with circuitry that allows him to control their bodies. Suspicious of the falcon that’s been following him, Mad Hatter sends Film Freak to locate its owner. Film Freak soon traces it to the hotel room shared by Bane and Bird. Bane confronts Film Freak in the street as Batman and Robin arrive to apprehend Mad Hatter. Batman and Robin defeat the mob, while Film Freak is killed by Bane. Batman overhears his death through Mad Hatter’s receiver. Robin mentions that Bane “busted up” Killer Croc earlier. This occurred in an issue not reprinted in the trade paperback, even though the events of the story will play a large part in Azarel’s motivations later on. The Bane/Killer Croc fight did make it into Bane’s first appearance on Batman: The Animated Series, however. Dr. Flanders (later given the first name “Simpson”) makes his debut. Flanders is a pop-psychologist who appears on various talk shows, rationalizing the actions of the escaped Arkham inmates. I Love the ‘90s: When Sgt. Bullock complains that the motives behind the Arkham breakout are unknowable, Officer Montoya tells him that not every day can be Hill Street. 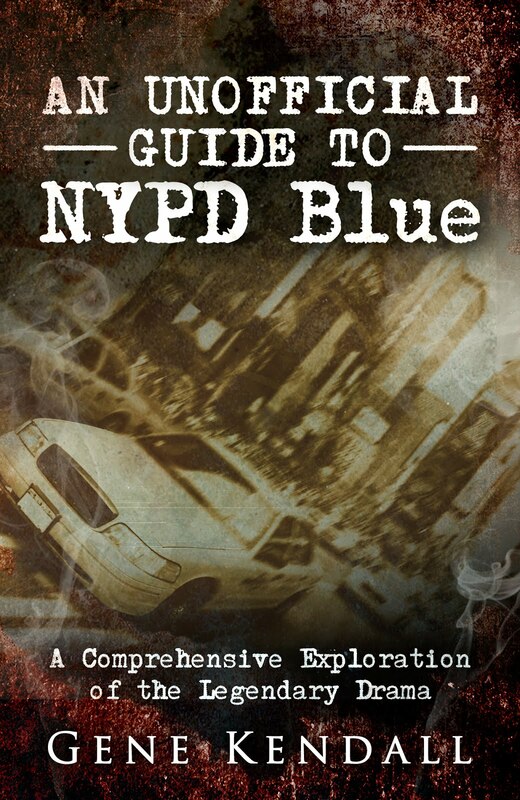 This was already a dated reference, since Hill Street Blues ended in 1987. Total N00B: I’ve never heard of Film Freak before. Apparently, he was considered disposable enough to be used as cannon fodder for Bane. 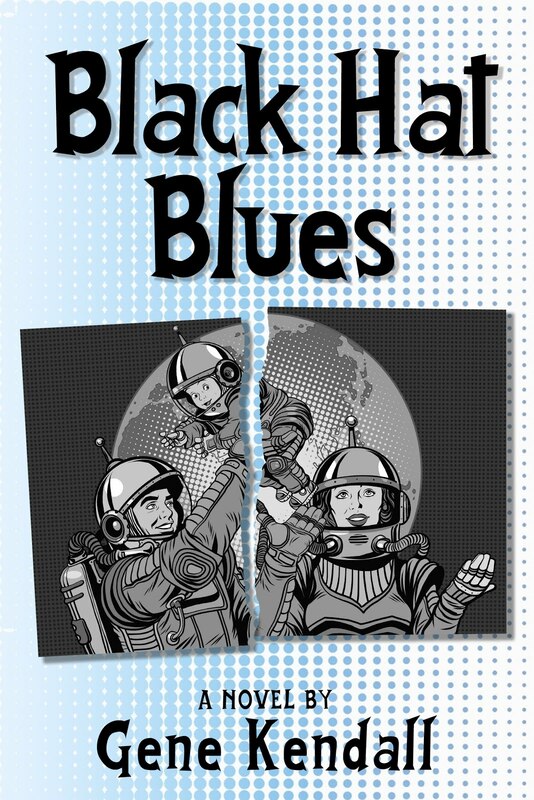 Review: And here’s where I complain that a 600+ page book of comic book reprints doesn’t have enough in it. I realize that the editors wanted the book to end with Batman #500, the double-sized anniversary issue that debuts Azarel’s new Batman costume, but cutting out early chapters of the story in order to hit that mark undermines the impact of later stories. Batman #500 isn’t necessarily the best chapter to close the book, anyway (even if it might be the last one with "Knightfall" on the cover). Azarel assumes the Batman role in Batman #498, which works just as well as a cliffhanger ending. This is supposed to be the complete “Knightfall” collection, yet it’s missing Robin’s first encounter with Bane, and the incident between Azrael and Bane that inspires their rivalry (Azrael’s furious that Bane dismissed him as not being worth his time). DC really should collect all of the stories leading up to “Knightfall” in one collection. 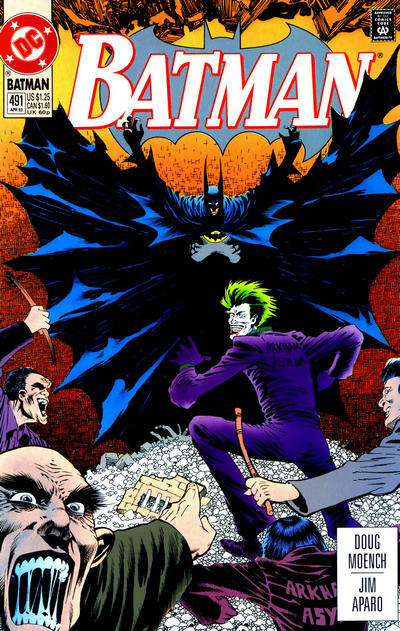 In addition to the Batman and Detective Comics issues that set up the event, the original “Venom” arc from Legends of the Dark Knight could be included, along with the Sword of Azrael miniseries. Apparently, DC let this one go out of print well over a decade ago, which is surprising. Is DC trying to erase Joe Quesada’s tenure with the company? 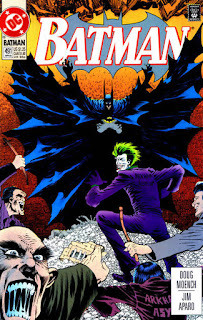 As for this specific chapter, it’s a fairly standard Batman story, although Batman at this point is supposed to be increasingly unhinged following the Arkham breakout (and some other vague events that preceded that event; again, stories not reprinted in the book.) In practice, Batman’s mental state has no real impact on the plot. He’s still searching out criminals and punching them out, only he’s grimacing more than usual. And Robin’s annoyed with him, because Batman only wants him as backup because things are getting too dangerous. Why exactly the Mad Hatter’s mob of mind-controlled thugs is even more dangerous than any of the other menaces Robin’s faced, I don’t know. Moench’s trying to up the stakes, but the plot isn’t doing much to sell the concept. What does work particularly well is the ending, though. Cutting in-between Batman and Robin’s brawl with Mad Hatter’s thugs and Bane’s murder of Film Freak does show a jarring contrast between Batman’s traditional opponents and the new threat Bane represents. Allowing Batman to overhear the murder also helps to create suspense for their upcoming confrontation. So, Bane’s still being set up rather well, even if the individual plots are somewhat dull. Summary: Bane and his men rob an armory and target Arkham Asylum. Using remote-controlled explosives and rockets, they break prisoners out of their cells. Joker remains inside to torment Jeremiah Arkham, as Batman arrives too late to stop the other inmates from escaping. 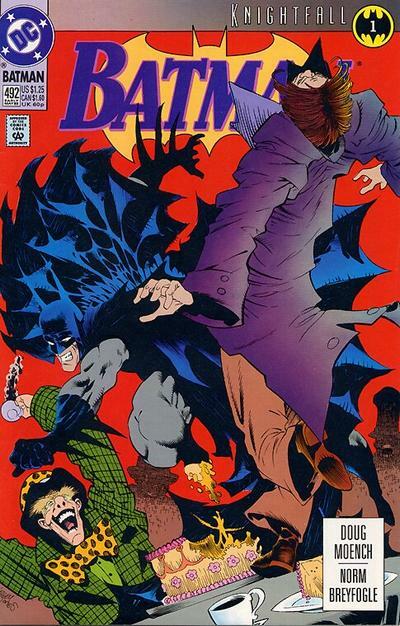 Joker makes his escape as Batman stays behind to free Jeremiah from a death-trap. Jean-Paul Valley gets a haircut from Robin, debuting a new look following his first appearance in the Sword of Azrael miniseries. Robin is wearing a black armband with the Superman emblem on it. This ties in with the concurrent “Death of Superman” event. Gotham’s new mayor, Mayor Krol, is furious with Commissioner Gordon following the armory attack. 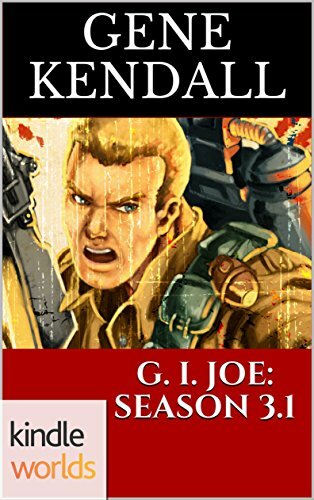 I’m assuming Krol’s election as mayor is part of an ongoing storyline, since Gordon remarks that Krol’s only in office because of his “machine,” and Moench’s dialogue seems to go out its way to paint Krol as a right-wing, anti-crime extremist. I Love the ‘90s: A police officer remarks that the Arkham inmates, who have received parachuted weapons from Bane, are more heavily armed than Saddam Hussein. 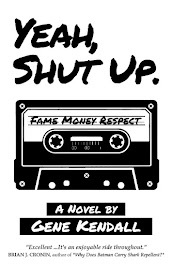 Total N00B: No effort is made to explain who exactly Jean-Paul Valley is. He also makes vague references to a recent confrontation with Killer Croc, which happened in a story not reprinted in the Knightfall trade paperback. Review: Wow, Vengeance of Bane has a few reminders that it’s from a different era, but this one is practically Adam West compared to the contemporary Batman titles. The story opens with Trogg, the caveman/electronics genius, breaking into a military armory with a giant toy robot, then has an Arkham Asylum breakout initiated by a bird carrying a balloon filled with explosives. And Arkham Asylum is a clean, well-lit facility located in a serene rural setting, as opposed to the decrepit haunted house that’s falling into Hell that we see today. (Was the animated series the first appearance of the truly “gothic” Arkham Asylum?) The story still tries to sell its importance, sixteen police officers die in the breakout and the story ends with Batman crying out in an outrageous wail of agony, but it’s not capital-letters SERIOUS at this point. And it’s still enjoyable, without anyone’s face getting ripped off or any bloody on-panel deaths. I suppose it could be argued that this is too traditional, though. The prospect of a massive Arkham breakout would be horrifying for the citizens of Gotham, which is something the tone of the issue fails to convey. 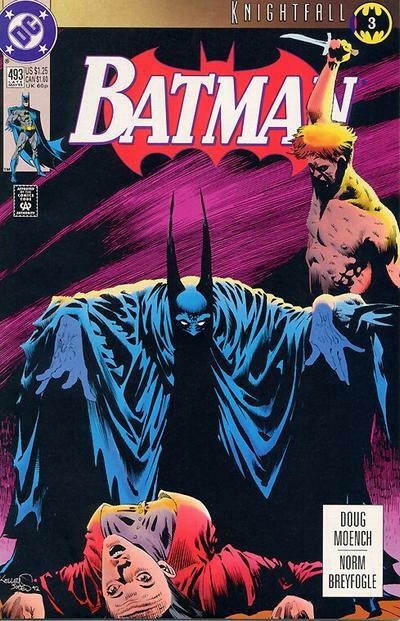 Still, it’s Batman, it’s fun to read, and there’s lovely Jim Aparo art to enjoy. Summary: In the Caribbean republic of Santa Prisca, a young boy is imprisoned for the crimes of his father. After his mother dies, the six-year-old is sent to live with the general population. He’s knocked off a railing by two fighting inmates and has a near-death experience. He sees a vision of himself as an adult, and of a giant bat that he’s told represents fear. 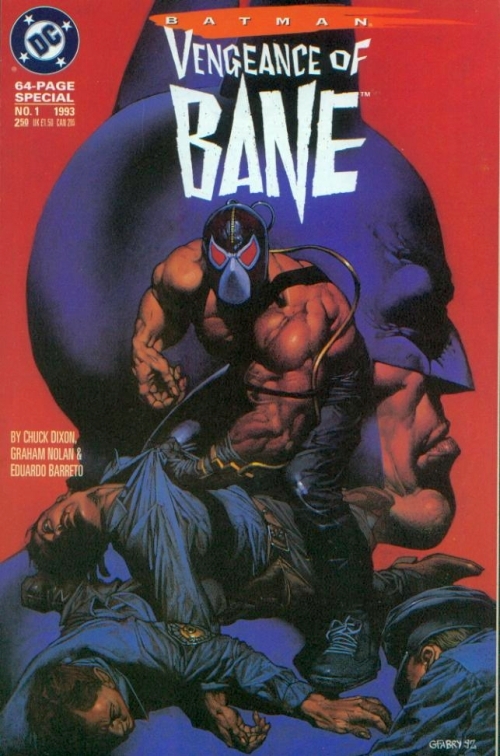 After the boy kills his first man, the guards name him “Bane.” Over the years, Bane is hardened by prison life, and eventually subjected to an experiment with the drug Venom. After Bane fakes his death, he returns to prison and demands the warden release his three allies, Trogg, Bird, and Zombie. American native Bird leads them to Gotham City, where Bane declares that he will destroy Batman and rule the city. 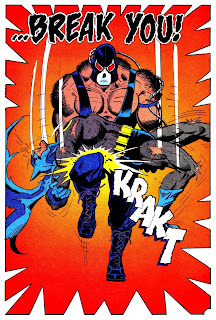 Bane arranges a confrontation with Batman, but refuses to battle him until he fully understands his opponent. Irrelevant Continuity: The nation of Santa Prisca and the steroid-like drug Venom were previously created by Batman editor Denny O’Neil. The original Venom storyline ran in Legends of the Dark Knight #16-20, and Santa Prisca goes back to his run on The Question. Bane is able to continue to feed himself Venom thanks to Zombie’s skills as a chemist and Trogg’s training as an electrician. They create a device that pumps Venom directly into his brain. Dramatic Exits: Batman abruptly leaves the alleys outside of the home of Bane’s first target in Gotham, Jimmy “No-Nose” Novak, while Commissioner Gordon is trying to explain the case to him. 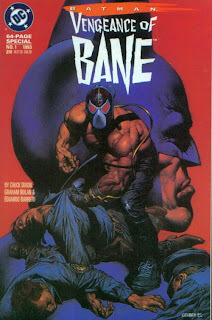 Creative Differences: DC officially credits Chuck Dixon, Graham Nolan, and Doug Moench as the creators of Bane. Dixon has always been adamant that Moench had nothing to do with Bane’s creation, however, and was simply in the room when the concept was being discussed. I Love the ‘90s: Bird has a mullet that will grow to more ridiculous lengths as the storyline progresses. Yes, Bane’s outrageously strong and twice Batman’s size, but he’s also a brilliant strategist, one that’s going to break Batman down mentally and emotionally before he even lays a finger on him. Like Batman, he’s a self-made man with his own set of daddy issues, but with no moral guidance to turn him away from the darkness. And all of this works very well as the basis of the character. However, he’s still a juicehead in a tank top and luchadore mask. All of the scenes of Bane reading stacks of books or meticulously plotting his overthrow of the Gotham gangs are meaningless as soon as a Hollywood producer or hungry freelancer too lazy to do research looks at him and says, “Okay, big guy. He’ll be the villain’s henchman.” (Batman: The Animated Series at least made him a hitman rather than a mindless flunky, but still chose to downplay his intelligence.) Bane doesn’t get a proper appearance in any of the media adaptations until The Dark Knight Rises, and even then his visual is simplified to “Guy in Weird Mask,” a look that makes him almost unrecognizable. As for the comics, it seems as if no one has known what to do with him since the massive “Knightfall” event ended. As a first appearance already commercially conceived to be “Important” this reads remarkably well. Bane’s origin is about as brutal as a mainstream DC comic could get at the time, without coming across as needlessly sadistic. Bane as the apex of physical and mental conditioning (before he even receives the Venom) has been compared by many to various pulp origins, but it reminds me of the characters Larry Hama often created in G. I. Joe. The prison setting works perfectly to make Bane’s lifelong obsession with masculinity and dominance believable, and it creates a nice contrast to Batman’s expensive, global training as a youth. This comic was published in 1992, so naturally there are elements that probably wouldn’t make it out of DC today. Most notably, Bane’s three allies: Bird (presumably inspired by The Birdman of Alcatraz, he’s a crook from Gotham with an unexplained influence over birds), Zombie (a former pharmaceutical employee who witnessed Bane’s birth in prison; his name has no obvious relevance), and Trogg (he looks like a caveman…get it?) I personally don’t have a problem with the characters; this is a franchise with recurring villains like the Mad Hatter and Calendar Man, after all, but it’s hard to imagine DC allowing villains that aren’t 100% deadly serious to be featured in such an important issue today. While DC tries to recreate events like “Knightfall” every month now, they seem to have forgotten that it was acceptable to feature villains that weren’t cold-blooded serial killers during the original big event storylines. And the slow-burn was okay, too, as this is merely the beginning of a storyline that takes years to reach a natural conclusion. I can’t imagine an event this massive making it to its end without at least one line-wide reality reboot disrupting it today. I haven’t totally given up on the “DC Casualties” series, but I’ve decided that maybe it’s time to review something DC published that people actually read. And DC’s certainly made that easy with its series of gigantic reprints of the ‘90s “Knightfall” storyline. Have you seen these things? Each one is over six hundred pages, around a year’s worth of Batman continuity, all in color for just under thirty bucks. (Okay, one cent less than thirty bucks, and it’ll cost over thirty dollars after taxes, but still…) I followed this event off and on when it was published, but I’ve only read about a sixth of the comics previously, so the vast majority of this material is new to me. And if this goes well, maybe I’ll explore some of the other stunts life-changing events from ‘90s DC that are in trade paperback. Has Hal Jordan’s descent into insanity been preserved for the ages? Summary: Cannonball takes a keycard from Dragoness, allowing his team to escape the MLF’s custody. 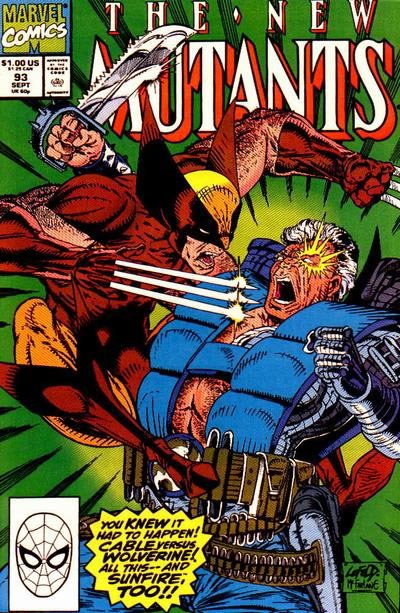 Meanwhile, Cable and Wolverine stop their fight after Cable explains the significance of the MLF’s plot in Madripoor. The two teams reunite at a warehouse the MLF is using to stockpile Sleet, arriving just as Stryfe appears. During the battle, Rictor accidentally causes Dragoness’ powers to set the building on fire. The heroes escape, unsure if Stryfe has survived. It’s confirmed that the armed soldiers that occasionally appear with the MLF are paid humans. Stryfe, not surprisingly, considers them expendable. Cable and Stryfe have their first on-panel confrontation. Cable declares that Stryfe won’t be able to kill any more women or children, which is broadly consistent with later revelations that Stryfe killed Cable’s wife and brainwashed his son. Boom-Boom and Cannonball have their first kiss. After Dragoness tauntingly kisses Cannonball, a jealous Boom-Boom decides to show him a real kiss. On the final page, Cable promises that rescuing Rusty and Skids is the team’s next goal. The next issue blurb on the same page swears that Cable was genuine, but unfortunately, the team will have to deal with the Genoshans next. For the record, Cable never does anything to help Rusty and Skids. “Huh?” Moment: Cannonball, with both hands restrained, is somehow able to steal a keycard out of Dragoness’ headdress as they kiss. Review: It’s not hard to see why an adolescent reader would love Rob Liefeld’s Wolverine. If you liked the giant, exaggerated cowl Jim Lee gave the character, then Liefeld’s got him beat. I’m not sure how Wolverine is able to hold his head up with this enormous thing around his face, but I’m guessing an adamantium skull helps. 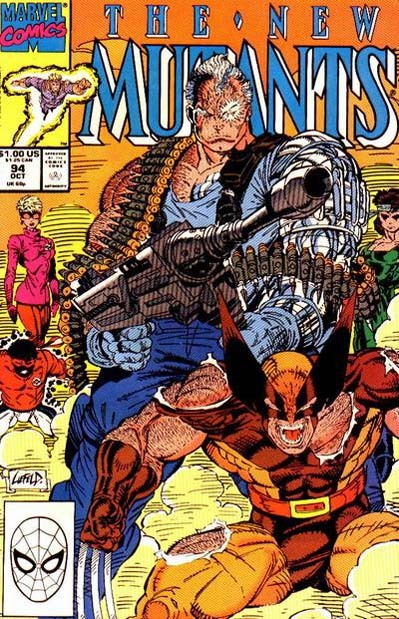 I initially wondered if Liefeld was inspired by Todd McFarlane’s interpretation of Wolverine from the “Perceptions” arc in Spider-Man, but looking at the cover dates, apparently it’s the other way around. I actually don’t mind this over-the-top rendition of the character, and it seems as if Liefeld has a lot of fun with him during the story. This is also by far Hilary Barta’s best issue as inker, giving the issue the faux-Art Adams texture that Liefeld’s pencils need. 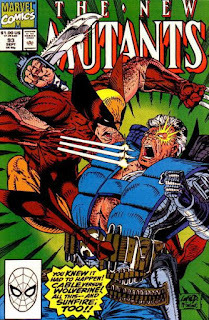 The story is largely an excuse for Wolverine and Cable to jump around during a series of giant panels, while the other characters dutifully get into the proper position for the climax. The issue would’ve been greatly served with a lengthier confrontation between Cable and Stryfe, instead of the mild one-page shootout we’re given. Stryfe’s supposed to be Cable’s greatest nemesis, his main motivation to fight, so seeing them together for the first time should feel like a big deal. Instead, the reader is simply given a few more cryptic lines of dialogue before Rictor screws things up (again) and the team’s forced to abandon the fight. Unfortunately, it’s just the first in a series of anti-climatic confrontations between Cable and Stryfe, which in retrospect, turned out to be one of the weakest rivalries in the ‘90s X-comics. Summary: Sunfire meets Cable and the New Mutants in Madripoor, where the Japanese government has traced the manufacture of Sleet, a new drug that was used to poison the water supply of a Japanese town. Cable’s convinced that the Mutant Liberation Front is behind Sleet. With the aid of portable Cerebro units, the mutants split up and search Madripoor. Cannonball, Boom-Boom, Warlock, and Sunfire are soon captured by MLF operatives. Meanwhile, Cable tracks a mutant signature that turns out to be Wolverine. They immediately fight, much to Sunspot’s horror. 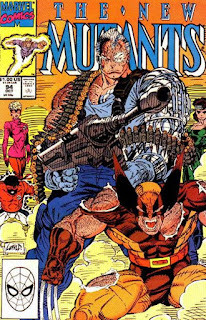 Rob Liefeld is still drawing Cable with that giant knife on covers and pin-ups, but I don’t think it’s ever used in any story. Cable knew Sunfire’s father, Suburo Yashida, and apparently has a deep respect for him. Whether or not he’s already met Sunfire is ambiguous, but Sunfire does tell Cable it’s a shame his son met such an “untimely fate.” This is another early reference to Cable’s son, a mystery that flounders around for years before it’s finally decided that Tyler, a.k.a. Mr. Tolliver, a.k.a. Genesis, is Cable’s son. (More accurately, his adopted son from his wife’s previous relationship.) Since Tyler exists in the future, it’s unclear how Sunfire knows about him. More of Cable’s advanced technology appears, as he rides through the sky with Sunspot and Boom-Boom on a flying motorcycle. He still hasn’t been identified as a time traveler at this point, however. This issue marks the first appearances of three MLF members: Dragoness, Kamikaze, and Sumo. As you might’ve discerned, they’re all from Japan (Dragoness even links her mutantcy to the “twisted genetics” created by Hiroshima’s bombing). This is the first indication that the MLF is a global organization, an idea that’s quietly ignored over the years. Stryfe meets the New Mutants for the first time, teleporting into the battle with Zero after Cannonball’s team defeats Dragoness, Kamikaze, and Sumo. He uses a “paralysis ray” (rather than his massive telekinetic powers, oddly enough) to incapacitate the team. Creative Differences: Numerous lettering corrections this issue. One is during Stryfe’s introduction of the Japanese MLF members to General Coy (who’s aiding the team in Madripoor). Another correction has Sunfire lecturing Cable on the futility of revenge when Cable talks about killing the man who killed his son. Later, Stryfe’s dialogue has been altered as he congratulates Zero for teleporting them into the battle just in time. An entire page of Cable and Wolverine’s fight scene has also been re-lettered, and judging by the shift in coloring techniques, I’m assuming the original page from New Mutants #93 has been altered somehow in the initial Cable and the New Mutants trade paperback (page 146 in case you’re curious). “Huh?” Moment: Boom-Boom is able to identify Kamikaze’s power as the ability to “explode on impact” even though this is the first time they’ve met and he hasn’t used his powers yet. Review: As the cover says, we just knew a Wolverine/Cable fight “had to happen,” so here we are. Before the story reaches that point, there’s a totally unrelated plot involving the MLF that must be addressed. I actually like this incarnation of the MLF, a global group of terrorists with a masked leader and a different set of mutants operating all across the globe. They’re a lot like Cobra, but since Cable is essentially a G. I. Joe character thrust onto a mutant team at this point, it works. If the MLF were ever allowed to develop as a concept, there’s a lot of potential here. Unfortunately, the team’s destined to become background players in Cable’s war against Stryfe, and once Stryfe is revealed as an insincere believer in his own cause, the rest of the MLF are just cast off as forgotten cannon fodder. I don’t think anyone’s ever cared enough about them to even use them as cheap shock value deaths. At the time this was published, of course, no one knew any of this was coming. I’m sure the target audience was thrilled to see Stryfe finally confront the team face-to-face, and to receive even more vague clues about Cable’s past. And throwing in Sunfire is a nice nod to longtime readers, as well. (I guess it could be argued that linking Japan and Madripoor creates the impression that Asia is much smaller than it truly is, but I think it helps to establish just how extensively the MLF has infiltrated the continent.) And because this book hasn’t totally left the Bronze Age yet, many of the ongoing character subplots are still advanced, even in the midst of an all-action issue. Cable has an internal monologue revealing how much he does care about his students, Wolfsbane’s relationship with Rictor continues, against the team’s objections, Cannonball is annoyed by Sunfire’s attitude and the revelation that Cable has a son, and Sunspot reflects on how much more respect he has for Cable than Professor Xavier. This leads into the final scene, as Sunspot witnesses Cable fighting another one of his idols, Wolverine, and is heartbroken. It’s melodramatic, yes (and I’m not sure if it’s ever been established that Sunspot has strong feelings either way about Wolverine), but you need these character moments, especially in a teenage superhero title. And, yes, I’ve skipped New Mutants #92. It was apparently an inventory issue involving the Skrulls, one that Marvel didn’t bother reprinting in the original Cable and the New Mutants trade, or in the newer editions. There might’ve been a one-page scene establishing why the characters are flying to Madripoor at the end of the issue, but I don’t feel like I’m really missing anything to be honest.